Duane Allman Project + Duane Betts, The Robin 2, Bilston, Monday 3rd September 2018. I’ve come here blind. I’m aware that The Allman Brothers’ ‘Jessica’ was the original theme music to TV’s Top Gear programme, and have recently discovered ‘Midnight Rambler’ is a song I recall as a reggae cover version from my youth. Other than that? Cowboy hats and a southern rock stance by the siblings of its originators is what I’m expecting. I get a lot more. Duane Betts comes on stage accompanied by rhythm section and guitarist, and he himself will sing and also play guitar. They start with a slow blues shuffle that offers a countrified middle eight. It’s laid back, there’s not much in the way of performance and that forces you to draw in and listen to the song. Next up, ‘Everybody Needs Somebody’ boogies up as the two guitars get into a groove, but overall we’re offered its bright breezy flavoured country rock. The guitars can be melancholy but they’re nearly always melodious. Betts’ eyes tend to be firmly fixed to his own six string, though he’ll strike the occasionally pose during a solo that leads you to believe he’s a darker horse than his stage demeanour would have it. When a keyboard player joins them they segue into a pretty jazz chorded chiming tune where the organ leads in melody before building progressively with interplaying guitars that reach out in harmony, and in search of new sounds and melodies beyond the obvious. This is jazz rock without the fusion as the guitars dance gracefully in flights of creative fantasy. Betts removes his cowboy hat, his lank long hair draped behind his ears, with shirt and jeans he’s visually nondescript, though in close inspection you note his resemblance to his father, Dickie. The drummer instigates an upbeat strong groove as the keyboard player moves to the other side of the stage to pick up on percussion and a new keyboard player sits in, Dr John the Night Tripper his obvious influence as the beard under the hat and atypical afro garb adds funk attests, and they proceed with a long instrumental passage where it sounds like Santana joined The Doobie Brothers and there’s a real tonal edge to Betts’s guitar at times. Solos come from all corners and it’s salsa by way of Stax, its long and worth hearing but then with a tip of his freshly picked up hat Duane Betts says “Thank you. You’ve been real nice!” and they’re off . Well, that was different I think to myself, and in a nice way. During the break in the gents, white haired men are trying to outdo each other the one’s claiming he saw Gregg Allman’s last UK festival performance, the other outshining him by claiming he saw the Allman Brothers in ’71 – I bet if I leaned over they’d be trying to shoot higher than each other into the urinals. Back on stage the same bass player, drummer and percussionist retake their positions and there’s a new guitarist in tow. They strike a hard beating sound with a warm organ flow and a cheers goes up from the audience as Devon Allman walks on stage playing guitar – Frankly my first impression is that he’s a grunge version of local hero Dave Hill from Slade the way his hair flops out under his hat, but he plays his strat with a grip like vintage Clapton or possibly his late uncle, Duane. Whatever, he plays to the crowd that’s for sure, and moving forward we get a closer look as he’s revealed a rugged looking guy with a friendly smile; his leather jacket’s sleeves rolled up to reveal tattoos on his forearms. “How are you doing? “ he calls out as the drummer sets up a rhythm, then raising his hands above his head clapping for the crowd joins in and things to become a little rockier. There’s a whole other atmosphere up on stage this half of the evening. Allman walks around playing guitar duelling with the second guitarist, the previously static bass player has becomes animated too now and the song ends amid a flurry of power chords. In what will be a series of musical contrasts, Allman straps on an acoustic guitar to perform a pounding number that has a slight AOR feel but a political edge lyrically then swopping back to electric to deliver a cover of The Spinner’s ‘I’ll Be Around’. This muscle-edged funky soul has women dancing to my left. Vocally, you can hear his father’s husk and mannerisms but there are modern nuances all his own, not least growling like a purring big cat, before rocking away on a scratchy guitar solo. Then, so sudden you want to press replay on the moment the front line make a sudden sideways 70s disco shift dance movement. It’s something you’re more likely to see performed by some smooth act like The Stylistics but it is so damn cool watching these macho looking dudes do it with such grace and precision. The bass player then treats us to a hard driven funk solo before the drummer comes in jamming away with him until finally power chords make way for an organ solo. On paper this is a strange number. Both because of my expectations of the type of band I would be seeing and to perform a song so early in the set. The fact remains it works marvellously and I find myself singing it days after (but unable to throw the dance moves). Next up, Betts’ guitarist joins in to play some “beautiful” slide guitar on Royal Southern Brotherhood number ‘Left My Heart in Memphis’. It begins atmospherically with an eastern flavour reducing itself to a minimalist approach musically whereby Allman’s voice sings out effectively. As verses take hold the music grows, with a mournful slide solo howling away in eventual conclusion. Swopping to acoustic again as a long piano introduction takes hold, a big cheers rings out as Duane Betts returns to the stage to sing The Allman Brother’s ‘Blue Sky’. It’s country sweet in the foreground rocking in the back, and receives even more applause once it ends. ‘Back To Where It Begins’ is another country rocker, guitars weaving delicately throughout, and while Betts maintains his introverted posture most of the time, he and Allman smile at each other as they play in harmony. “Gonna play you a song my dad wrote about my mom,” says Allman as four stools are brought on stage for the frontline of guitarists to perch themselves on. He picks out the opening notes to The Allman Brothers’ ‘Melissa’ and we’re treated to some piano playing that sparkles and shines in its performance throughout. Next up the keyboard player actually takes lead vocals as Allman leaves the stage. It’s a funky freeform number with strong harmonies and as you listen to the lyrics you slowly realise they’re playing a reinvention of Marvin Gaye’s What’s Going On. With Allman back on stage standing beside Betts you get this picture of them being renegade thrash metal fans in their youth, who’ve come back like prodigal sons, rediscovered their heritage and added something new into the pot. The music they now play is like a hybrid of George Benson and Santana with upbeat guitars flitting between harmony riffs and a jazzier kind of rock, while bass and drums meshing in sympathy with each other. The slows blues of ‘Midnight Lake Michigan’ is next, with all the guitarists now on stage, their playing prowling with dangerous intent. Yet again, Allman slips off stage, this time as the bass player takes another solo, followed by Betts’ own guitar inversions over the polyrhythmic sound of the band. Then, another guitar solos away but it’s not from someone on stage and slowly the crowd turns to see Allman has somehow appeared half way down the hall playing away and now beginning to circle round ensuring those in need of seats at the back are given a good vantage of him and, before slowly edging back towards the stage. Once at the front he look up at Betts and the pair of them trade licks, turning again to face the crowd as they harmonise their guitar, then with one final anticlockwise roam round the front of the audience he through a stage door before returning back on stage. He then proceeds to announce each member of this combined band and in a crescendo they finish, Betts smiling to himself content, gently laying his guitar down. They return for but a single encore, ‘Midnight Rambler’. It’s layered in melody, comes armed juiced in southern rock, Americana, the soulful R’n’B sounds of Stax and rocks steady throughout. 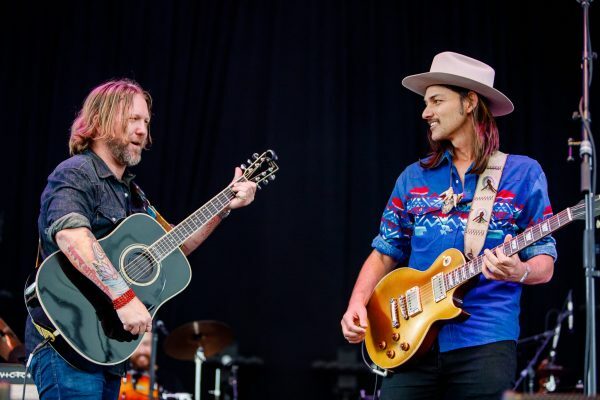 Devon Allman and Duane Betts have stepped outside beyond any parental shadows, but what a legacy they share. They line up and bow, but in truth the sons of the south stands tall tonight.